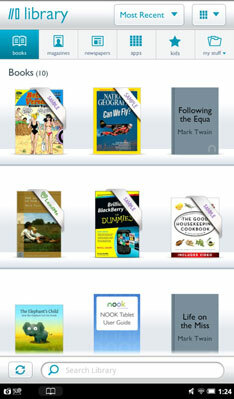 The Library is where all documents live on your NOOK Tablet, including books, magazines, newspapers, and personal files. The Library is all inclusive, while the individual panels for Books, Magazines, and Newspapers hold only files that the system recognizes as fitting that description. To some extent, you actually can tell a book by its cover on the NOOK Tablet: not so much about what’s inside, but a great deal about its status or stature in your collection. New. Freshly downloaded and ready to be opened. This badge goes away after the first time you open the document. Sample. A free sample of a book or other publication. Download. A publication that’s either downloading or is waiting to be downloaded from BN.com. Pre-order. A title has been announced and is for sale, but isn’t available for download yet. If you buy it, the book or publication will arrive at the first opportune moment. Recommended. A friend or contact has suggested that you check out this title. LendMe. A book that you can loan to someone. Any search you start from your Library is done there only; if you start from the Home screen, the search expands, even looking at the B&N store if it can’t find the title you want already on your tablet. To access the Search tool, tap the ∩ button to display the quick nav bar. Then tap the Search button.